If I took a poll right now on who hates laundry and folding and who is a crazy person and doesn’t mind it, I’m pretty sure the results would be 99.9999% of people absolutely hate both. But, is it actually laundry we hate? Cause in reality, laundry is kind of a whole process. There’s about a million steps, and I can’t say I hate each and every one. The problem is just finding a way to save time and save space. Let’s break it down and then I’ll share how I got past the whole laundry phobia. Wander around the house and pick up dirty clothing, towels, and strip the sheets. Or, if you’re organized, get your laundry baskets. Separate. I’m lazy, and I don’t separate by colors the vast majority of the time, but I always wash sheets and towels separately from my clothes. Put a load in, play the waiting game and consume snacks and daytime TV while you wait to switch it over to the dryer. Drag yourself out of your chair to switch it over and dread when the buzzer goes off. Get up, open the dryer, die inside. You’ve opened the dryer, and now you have arrived at what everyone truly hates about laundry: folding clothes. It’s bad enough that you have to fold all the towels and washcloths and the worst of all…fitted sheets. But then you get to the clothes. All my life I folded my t-shirts, my sweaters, my jeans, and shorts. Pretty much anything that was bigger than a wallet, I folded it. Then what happens? Next time you go to get your neatly folded clothes, with their crisp sharp folds, those sharp folds have left the WORST creases in your clothes. Now, I’m stuck either looking a mess or now dragging out the ironing board and ironing my clothes, which, if possible, is something I hate more than doing laundry. If you’re here, theres’s a good chance you might be a minimalist or someone interested in living with a little less. Anddd that probably means there’s a very good likelihood you’ve read one of my most loved/hated books: The Life Changing Magic of Tidying Up. There is a ton of good advice in that book. There’s a lot of real bad advice, too. If you’re looking for someone who isn’t going to hold any punches and finally make you throw out your dance recital costume from 2nd grade, Marie Kondo is your girl. If you’re looking for someone who tells you how to organize these few possessions you now, she is not your girl. I am. Me, I’m a regular girl and I don’t really like the advice that I should have open shelves and always put away my kitchen tools, because that is their proper place. One big thing that hangs people up in that book is folding all of your clothes. The book is a little bit campfire, hippy dippy and possessions have feelings, so we should care for our possessions and clothing by lovingly folding them. Um, I watched Toy Story too, but I think there’s something wrong with that. Yes, we should always treat our possessions with care, but with the kind of care that we have time for and enjoy. If caring for your possessions is a chore, then you just won’t take care of it at all, which is much worse in my opinion. I hatedddd folding my clothes. No matter how many times I tried the patented way of folding clothes, I always, always ended up with wrinkled clothes. And worse, I was frustrated because the stuff I owned wasn’t made of these great, structured folding fabrics shown in the videos and pictures. I had the flowiest and loosest cardigans and slippery t-shirts, that no matter how you folded them, they ended up in a lump at the bottom of my drawer. Then, I have people telling me that I fold my clothes I will save sooo much space! Guess what? It doesn’t! It doesn’t save space and it only creates more work and time spent doing not fun chores. Folding clothes is truly the worst. I spent some money on affordable but great quality hangers, and I’ve never looked back. Every, single thing I own (minus underwear) is now hung in my closet. I bought three different kinds of hangers, all on the cheap cheap and I’ve never had so much space in my closet or dresser. And believe me, I know what it means to have a tiny closet. I have never had a walk-in closet. In fact, I am currently using my smallest closet ever, but it feels the biggest because of how I hang all of my clothes. My closet is only 3 feet wide with two bars, but you would never guess that I usually have over 150+ things hung in there. Here are the links to the three types of hangers I use, and I’ve explained super quick below why I use each. The velvet hangers I use for the majority of my clothing because they’re thin, take up less space than wooden or plastic hangers, my clothes don’t slip off, and they make my closet much easier to look at than a bunch of mismatched hangers. Also, having all of the same hangers saves wayyy more space than you’d think! The next hangers are for pants and my favorite feature is that I can easily grab my pants without moving the hanger. If you leave the open end out towards you, you no longer have to carefully slip your pants out of hangers and get them all twisted and end up with creases on your knees. Seriously, these are genius. Finally, these clip hangers! 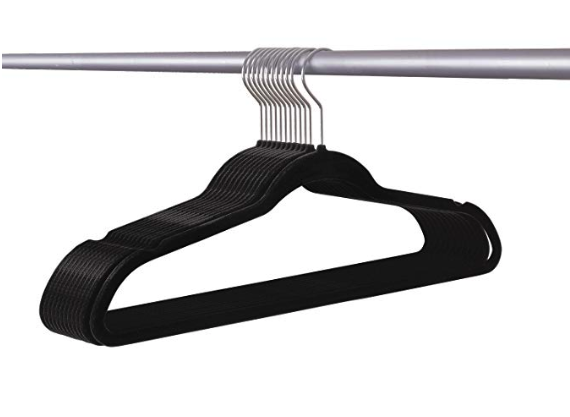 These are called add-on hangers, because they can hang alone, or like in the picture, you can hook a bunch of them on each other to save a TON of space. I hang all of my shorts (6 pairs) together and it only takes up the space of ONE hanger!! I also hang all of my skirts this way, and I swear doing this gave me back at least 40% of my closet. Just hang your clothes. Forget folding to save space. It doesn’t work. It’s the stupidest, simplest solution, honestly. But, half of us are still stuck folding our clothes, because that’s the way we’ve always done it. Doing things the way you’ve always done it is just gonna get you where you’ve always been: stuck. I still don’t just love doing laundry, but, now I have three of my favorite benefits ever. I don’t have to spend time folding clothes and stuffing them in already stuffed dresser drawers. Because I didn’t fold my clothes, I no longer have to pull out the iron every time I put on an outfit. My closet looks much cleaner and I don’t risk tipping over a stocked full dresser on my foot every time I open it. Now, go hang alllllll the things! Want to organize your close even more? The One Time of Year You Can't Wear White. Hint: It's not After Labor Day.